THIS was my career plan, although, I never thought I’d actually have the guts to follow through with it. 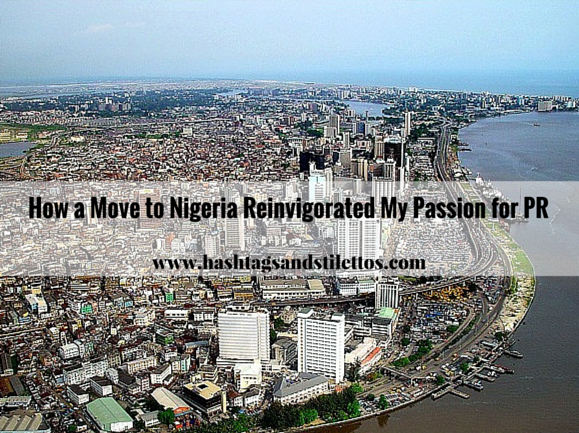 I mean–who moves from their comfortable upper-middle class existence [in America] to go to Nigeria? Before I officially moved, I was able to take several trips to Nigeria and saw with my own two eyes how lush and beautiful it is there. Beauty that so many people miss out on because when you have to rely on media images and stories about the continent, it’s hard to truly know how amazing Africa, and Nigeria in particular really are. Basically, Africa needs every good publicist it can get! A year and a half ago, I packed my condo up and took the leap. I was tired of feeling like a hamster in a wheel and wanted to eventually become an entrepreneur, which is much easier to do in a market that is not as saturated as America. I knew what my long term goals were and I knew that I wanted Nigeria to play an important role in my future. Do your research. Get to know your potential market as well as you can before taking the leap. Identify and talk with people who could be your potential clients, competitors, friends, employers, employees and so on. Without the internet and social media this would have been a much harder task a few years ago. If you can afford it, take a trip before your final move. Meet with as many people as you can, explore as much as you can. Think about where you want to live, how much money you’ll need, who you need to know and what you want to accomplish. Use this visit to make a final checklist of things you’ll need to do before you become a resident in your new country. If you’re moving from an industrialized country to a developing country, please leave any notions of saving the children, animals, country, etc. One of the biggest lessons I’ve learned [while living in Nigeria] is that no one needs saving. While developing countries do need an influx of well-educated people, those people also need to be completely respectful and understanding of said country’s culture. Culture is very deeply embedded into everything we do and you have no idea how intensely this runs until you are completely removed from yours and entrenched in a new one. So while my original vision included “saving the world,” I quickly realized that I needed to tone that down and focus on my own individual world first. Even though I was already familiar with Nigerian culture (disclosure: I am Nigerian, but have never lived here before) I met, and got advice from key people in the public relations industry before I moved. I also took a job as a Project Manager at an events and entertainment company for a year in order to get a feel for the Nigerian corporate culture and expand my network before striking out on my own. If you’re thinking about moving abroad for work; do it! As I learned with my move, it is insanely quiet outside of your comfort zone. Leaving your comfort zone in such a drastic way sheds away all the noise of your day-to-day life, the people you talk to everyday, your job, your normal responsibilities and provides a chance to hear yourself loud and clear. Even if your move is temporary, it will help you in the long run. Especially, if you’re in the public relations, events or entertainment space. The opportunity to see the world through a different lens can and will reinvigorate you and renew your passion for the industry. It’s also an opportunity to challenge yourself, apply your skills in a new way and create a global network. If I had to choose, I would totally move to Nigeria all over again with no regrets. Reni Somoye is a PR and Events Specialist and expatriate who is currently living in Nigeria. To learn more about her journey, send her a tweet @ReniSomoye.